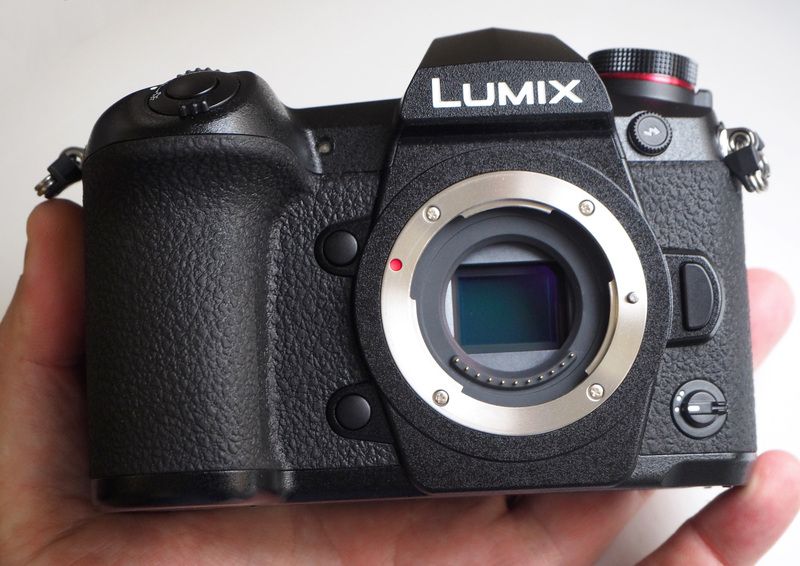 Here are the cameras, we think, are the best you can currently buy for low light photography. 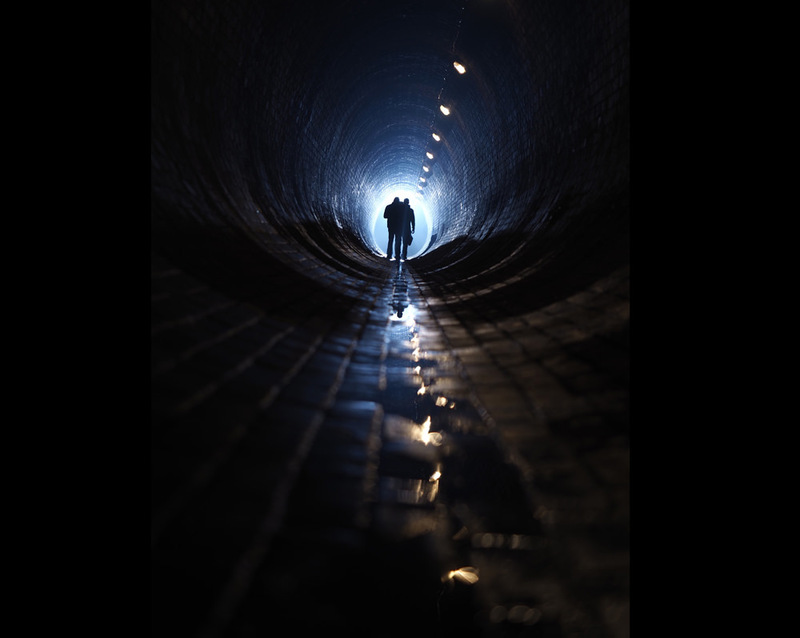 Low Light Photo In A Tunnel By Joshua Waller. So, you want to take photos of the night sky, stars, or night scenes? Or, perhaps you want to capture photos in small, indoor venues where the lighting is poor, or you might want to shoot underwater where the light levels drop dramatically as you descend into the depths of the ocean... In all of these situations, a camera that performs well in low light is what you're going to need. For low light photography, you need a camera with a large sensor and bright lens (f/1.2, f/1.4, f/1.8). The latest sensor technology such as BSI CMOS sensors give an advantage here as do cameras that can handle noise well. Low-light is also going to lengthen shutter speeds so if you don't want to increase the ISO speed to reduce exposure times, image stabilisation will help, either in the form of lens-based optical image stabilisation (OIS) or sensor-based image stabilisation (and in some cases, you get both). If you want to freeze motion, then you'll need a fast shutter speed, a higher ISO setting and the fastest lens you have (or can afford). With all of this in mind, we've gone through our reviews to find you the best cameras for low light photography. To gauge this, we looked at the highest usable ISO speed where images still show good colour reproduction, with good colour saturation, reasonable levels of detail and reasonable levels of noise. Because we've taken test shots in controlled lighting conditions, we're able to compare one cameras results to another. Please use this as a guide as to what the highest ISO speed is with good results from each camera, but also make sure you have a look at the full reviews to see if the noise performance shown is what you're looking for, as your requirements may vary. The below list is split into categories so you can easily navigate it. The categories are: Full Frame Cameras, APS-C Cameras, Micro Four Thirds, Serious Compacts and Waterproof Compacts. These cameras all feature a Full-Frame sized sensor, which is the same size as 35mm film, giving a shallow depth of field, and often a very wide ISO range which is useful for low light photography. In our review, we found that noise is very well controlled from the lower ISO settings and, impressively, detail can be found in images up to ISO25600. However, detail drops at ISO51200, as noise increases and colour saturation is reduced. ISO102400 can still produce usable images, particularly if using them on the web, however, the higher ISO settings of 204800 and 409600 are probably best avoided. There are noise reduction options of Off, Low and Normal, with Normal being the default setting. When using E mount and A mount lenses with OSS (Optical Steady Shot) image stabilisation the camera will compensate for 3 directions, with 2 compensated with the lens. When using a standard lens without OSS, the sensor will be using for image stabilisation, using the 5-axis sensor stabilisation system. 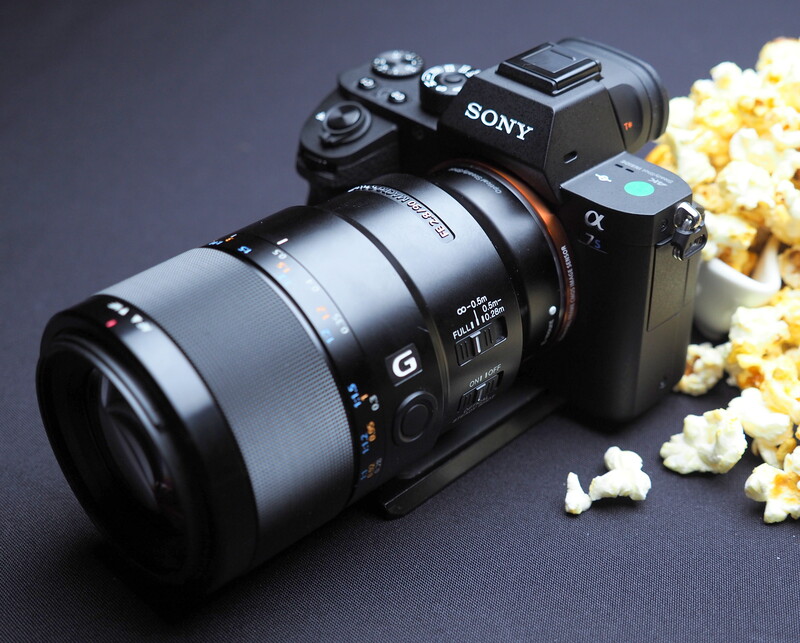 The camera's built-in image stabilisation system does a good job of keeping shots sharp even with slower shutter speeds and by using a backlit CMOS sensor, Sony has managed to reduce noise levels when compared with previous models. For lower light situations, ISO3200 to ISO6400 provide good results, although noise increases slightly and detail is reduced. At ISO12800 and ISO25600, noise levels become stronger and we would recommend avoiding these settings if possible, although results may still be useful if resized and used on the web. ISO51200 and above is best avoided as noise is high, and detail is low, particularly at ISO102400. For the lowest noise and best detail possible we would recommend using ISO50 to ISO1600 as images have low levels of noise and good levels of detail. 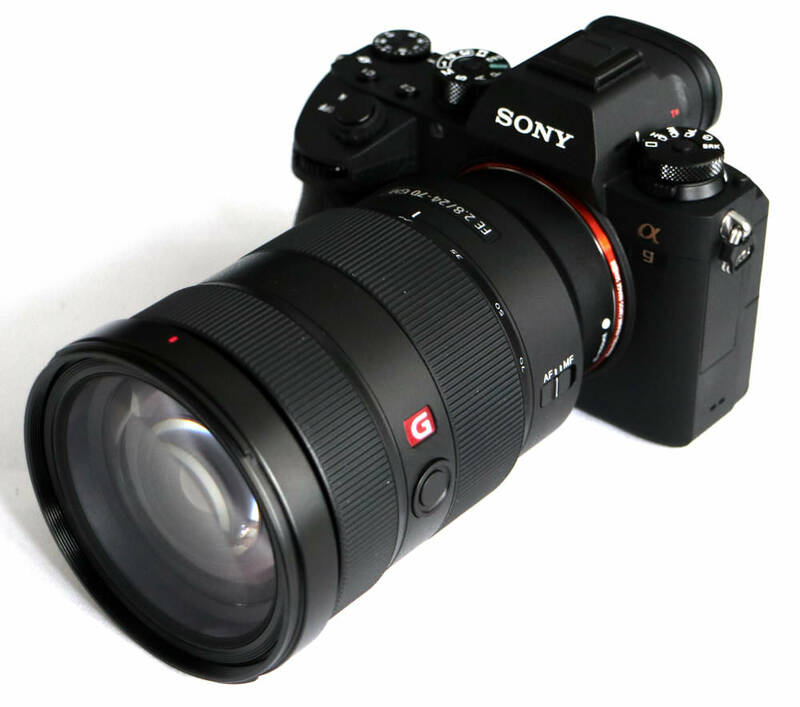 Another factor that is important with such a high-resolution sensor (as we see in this camera) is shutter vibration, and to combat this Sony has developed a new shutter system with no vibration and reduced noise. In addition to this, in order to get sharp results, the camera's built-in 5-axis image stabilisation system moves the sensor to ensure shots are sharp and detailed even when shooting hand-held. The lower pixel count on the full frame sensor does suggest that noise may be well controlled and on test, this was proven to be true with images, essentially, being noise-free up to around ISO 800, after which detail begins to suffer and by ISO 6400 results are becoming quite mushy. Higher ISO values are not recommended unless they are the only way to get the image desired. As for the 5-axis image stabilisation built into the camera, it is claimed to offer up to 5 stops advantage. However, the best we were able to achieve was 4 stops, but within that limitation, the system did the job very well, and will also help with video recording. Shooting with a 45.7mp camera makes it easy to spot any errors made in focus or errors caused by using a shutter speed that is too slow, resulting in image blur. We'd recommend the use of a lens with VR (Vibration Reduction) image stabilisation, or high-quality prime lenses to get the best out of the camera, and it's also important to be aware of your own shooting style, as care may need to be taken to improve your shooting technique to get the best out of the camera. For the lowest noise and best detail possible we would recommend using ISO64 to ISO3200, as images have low levels of noise and good levels of detail. Noise is extremely low and doesn't really begin to show up until you reach ISO6400 where detail starts to reduce. However, for low light situations, ISO6400 to ISO12800 still provide good results. Even when you reach ISO25600, the camera still produces usable results, with good noise control (depending on your intended use). At ISO51200, noise levels become strong and we would recommend avoiding this setting if possible as colour saturation drops off, although results may still be useful if resized and used on the web. ISO102400 is best avoided as noise is at its highest high. ISO32 is also available but it shows lower dynamic range. Noise reduction options available are: Off, Low, Normal, and High. 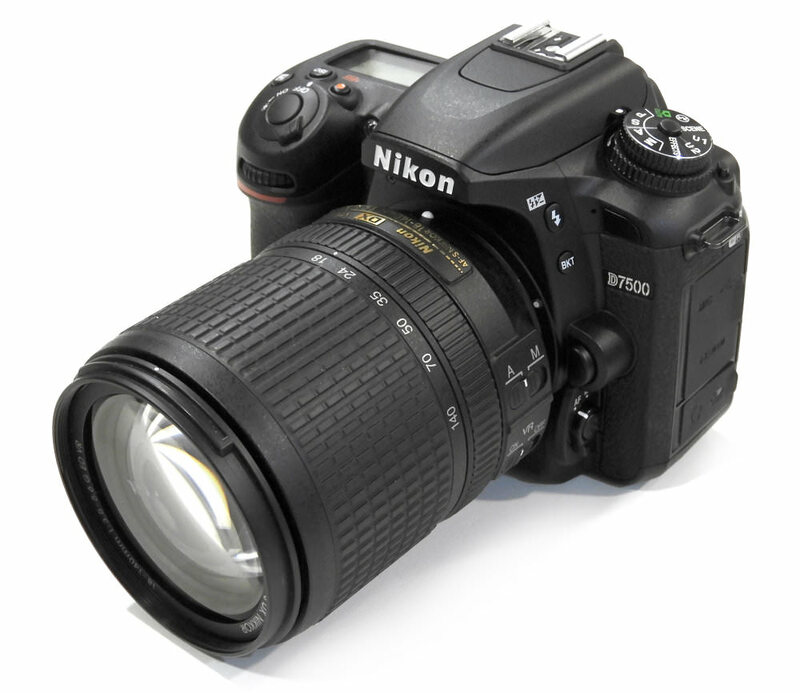 We took photos using the default setting of Normal, and users of previous Nikon DSLRs may want to reduce this to Low, as the default setting has quite strong noise reduction. 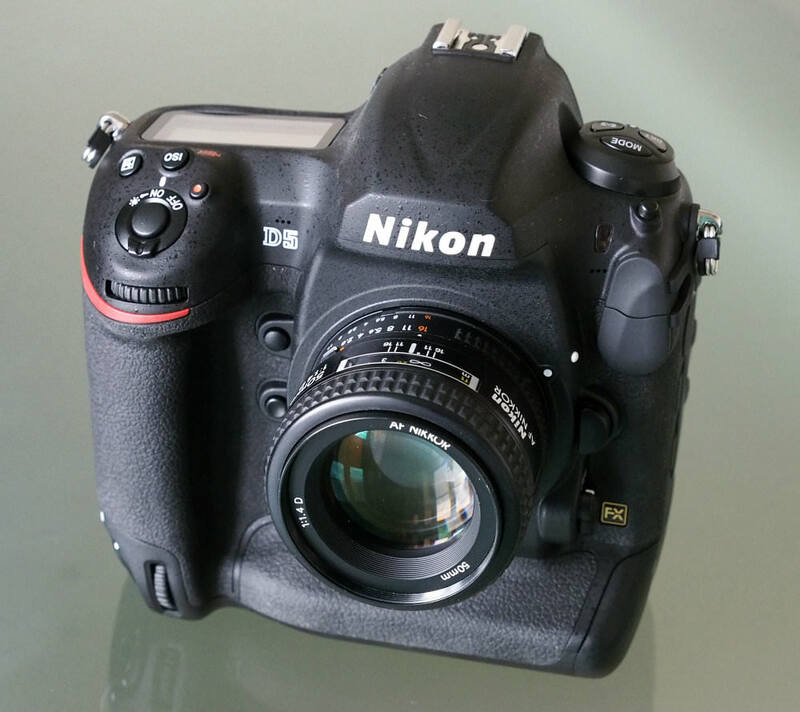 When compared to the Nikon D810, the D850 gives improved noise performance while also giving an increased resolution. The D850 also offers a similar performance to the Sony Alpha A7R Mark II which too has a full-frame high-resolution BSI CMOS sensor. Overall, thanks to the new BSI CMOS sensor, noise performance is excellent, giving you have a wide ISO range, unlike some high-resolution competitors, such as the Canon EOS 5DS/R with its limited ISO range. The noise performance is an improvement over the Nikon D810, with cleaner results straight from the camera, giving a higher usable ISO range, whilst also offering an increased resolution. The camera will, however, show any weaknesses in your photography technique, whether weak lenses, slow shutter speeds, or shaky hands. You may have to be prepared to improve your technique or possibly your lens collection, with the best performance possible with prime lenses. Image stabilised lenses are definitely recommended, particularly if you want to record video without a tripod. 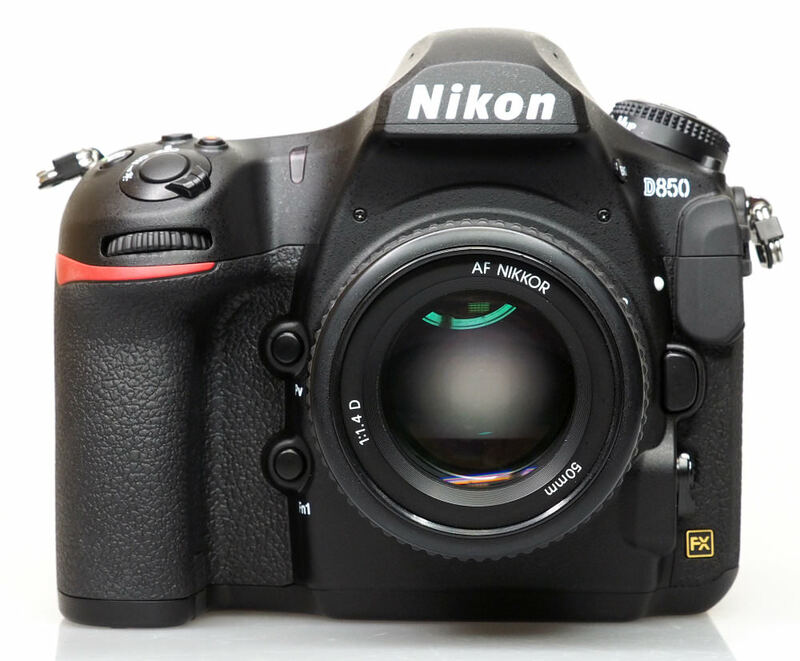 The Nikon D5 is Nikon's top of the range high-speed professional Digital SLR that has an ISO speed that goes all the way up to 3.2million and it definitely gives better noise performance than the Nikon D4s, particularly at ISO12800 and ISO25600. At ISO51200, there is better control of chroma (coloured) noise compared to the D4s, and results are still good. At ISO102400 colour starts to drop off as noise increases, and it's at this ISO speed that you'd most likely want to process the image further or avoid this setting. ISO204800 (Hi 1) may provide usable results if further processing is applied, or the images are resized for use on the web, but above this ISO setting, at ISO409600 (Hi 2) and above, noise becomes very strong, colour saturation drops and noise becomes dominant and quite unpleasant. Something interesting to note is that bright whites still come through fairly well even up to Hi 3 which may be useful for black and white surveillance photography. Noise performance from the Nikon D5 is better than the Canon EOS 6D, 5D Mark III, 1D X, Leica SL, Sony Alpha A7 II, and A7R II. There are also High ISO NR options of Off, Low, Normal, High, with Normal being the default setting. Without a doubt, the Nikon D5 has some of the best noise performance we've seen from any camera, and image quality is excellent. The Canon's ISO range goes from ISO50 (Extended), all the way to ISO409600 (Extended). We took the below shots with the default noise reduction settings, and auto white balance set to "White" results. High ISO speed NR settings are Disable (off), low, standard (default), and high. 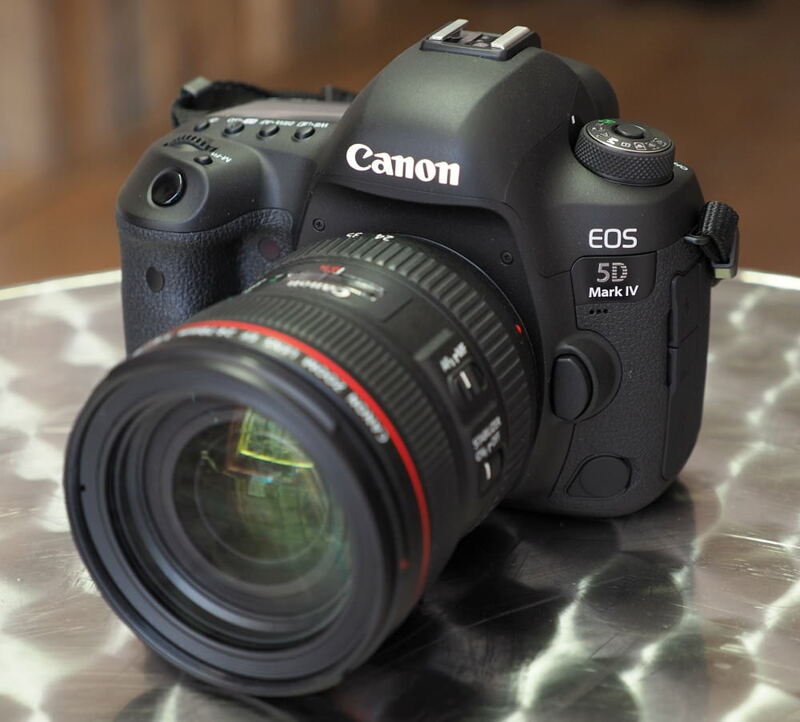 The big question is how the Canon EOS-1D X Mark II performs compared to the Nikon D5 for noise at higher ISO speeds. From ISO50 to ISO3200 there's not much difference between the two cameras. At ISO6400, there's a slight difference, with stronger noise reduction on the Nikon D5, which results in slightly more detail in the Canon image. At ISO12800, there's a slight drop in colour saturation on the Canon, with slightly coarser (larger) noise visible, compared to the D5 image. This is continued at ISO25600 with the Nikon D5 producing an image with less noise that is finer and images have better colour saturation. At ISO51200 noise increases for both cameras, and colour saturation drops. At ISO102400 noise gets a little uglier on the Canon, but colour saturation remains quite good, whereas it suffers on the D5, particularly the darker colours. ISO102400 may still be usable on the Canon but above this noise becomes quite ugly and it'd be best to avoid using an ISO setting above ISO102400. ISO204800 looks better on the Nikon D5 and whilst you wouldn't want to use ISO409600 on either camera, the results from the Nikon D5 are better with more definition in details. Ultimately, both cameras produce results that can be used happily up to ISO25600, or processed further at higher ISO settings, with reasonable fairly results up to ISO102400. Processing the raw files, or resizing images for use on the web would also reduce noise levels. 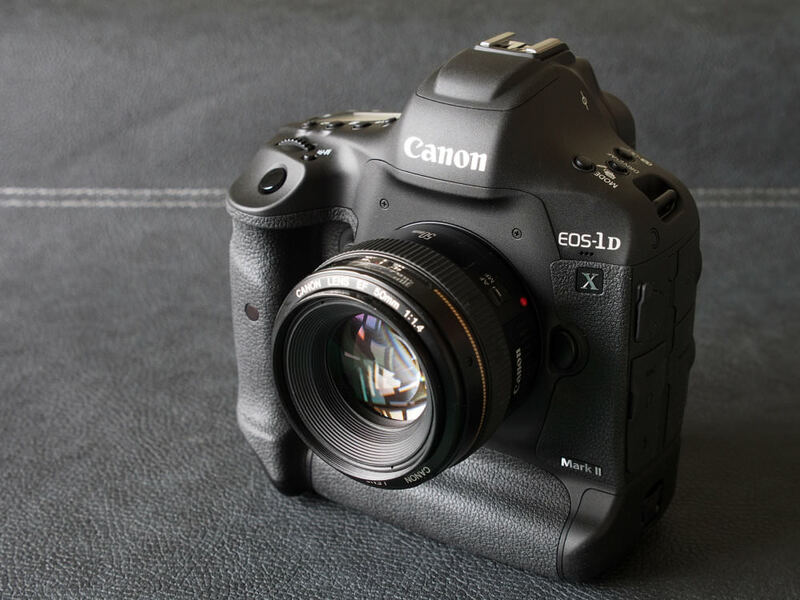 The Canon EOS-1D X Mark II performs exceptionally well, delivering excellent image quality with excellent noise performance. Noise performance is very good between ISO100 until ISO6400 when some noise starts to appear. ISO25600 is most likely the highest ISO setting you'll want to use without applying further processing to images, as noise becomes much stronger at ISO51200, and at this setting, you're best resizing the image or converting to black and white (or both). The ISO speed goes up to ISO102400, and this setting is best avoided. At the lowest ISO setting of ISO50, dynamic range is reduced. Noise performance is similar to the Canon EOS 5D Mark III, although, at higher ISO settings, including ISO25600, there is less chroma noise (coloured patches of colour) in the 5D Mark IV images. 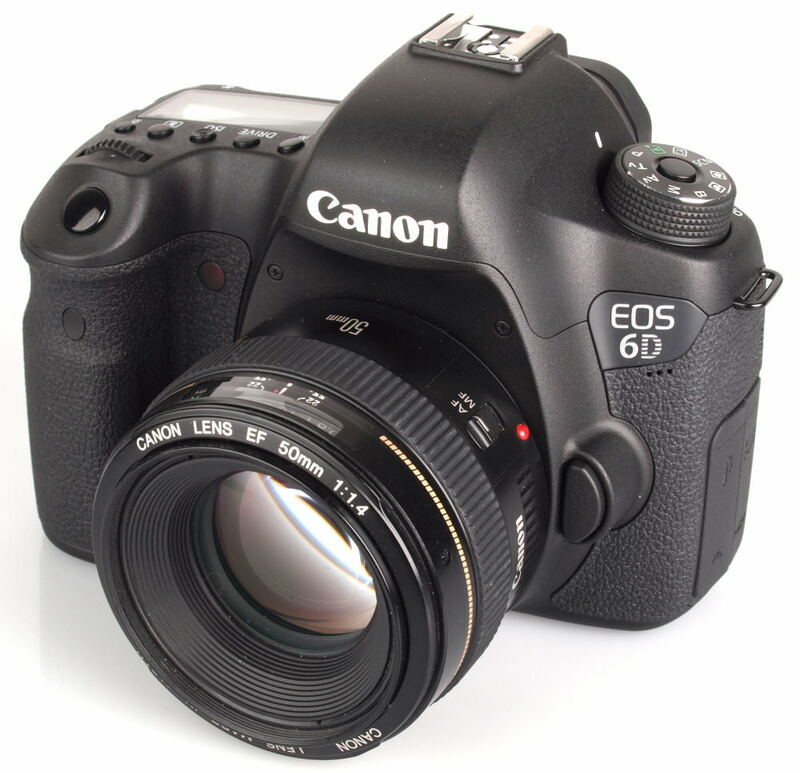 Processing 5D Mark III raw images with the latest version of Adobe Camera Raw is likely to get equally good results. Noise performance at ISO25600 is better than the 36 megapixel Nikon D810, and Pentax K-1, and very similar to the 42 megapixel Sony A7R Mark II (which goes to show the benefits of BSI CMOS sensors). Noise reduction options are: Off, Low, Standard, High, and if you're shooting JPEG only, then there is a Multi-shot Noise Reduction option. We took these shots with "High ISO speed NR" set to Standard, which is the default option. With a 20.2 megapixel sensor, the Canon EOS 6D offers ISO50 to ISO102400 when using the ISO expansion feature. Images are virtually noise free at ISO50, 100, 200, 400, 800 and 1600, with a very slight increase in chroma noise at ISO3200. There is also a very slight loss of detail at ISO3200. There is a more noticeable increase in noise at ISO6400, with the slight loss of detail again, however, images are still very impressive. At ISO12800 the camera does a good job of controlling the noise, with just a slight increase again, although detail does suffer. At ISO25600 noise becomes quite dominant, particularly in darker colours. At ISO51200 noise is more noticeable again as red, green and blue dots and patches start to appear. Noise gets quite ugly at ISO102400, and it's best to avoid this setting. To find more Full-Frame Cameras, have a look at our 'Top 12 Best Full-Frame Digital SLRs' list. All of the cameras listed under this heading feature an APS-C sized sensor, also known as crop sensor. Even though their Full-Frame family members tend to offer better low light performance, APS-C cameras shouldn't be ignored as low light performance is still good and the cameras under this umbrella are often more compact and cheaper than Full-Frame models. With the same sensor as the D500, low-light performance is the best in class. Essentially, you are getting the same D500 image quality, at a lower price point, and in a more compact camera body. This means you can benefit from the best-in-class noise performance, giving usable ISO up to ISO25600. However, for high-speed shooting, the D500 is still the quicker option. The Nikon D7500 produces images that are sharp straight from the camera, with low levels of noise and good levels of detail from the base ISO setting, all the way up to ISO6400 and ISO12800. You may find images taken at ISO25600 usable when resized, or depending on what subject you are shooting. At ISO51200 noise is stronger, but colour saturation remains good. At ISO102400 noise becomes much stronger again, although colour saturation for some of the brighter colours is reasonable. Above this noise becomes particularly ugly. Photos taken with High ISO NR set to Normal (Default). The options are Off, Low, Normal and High. 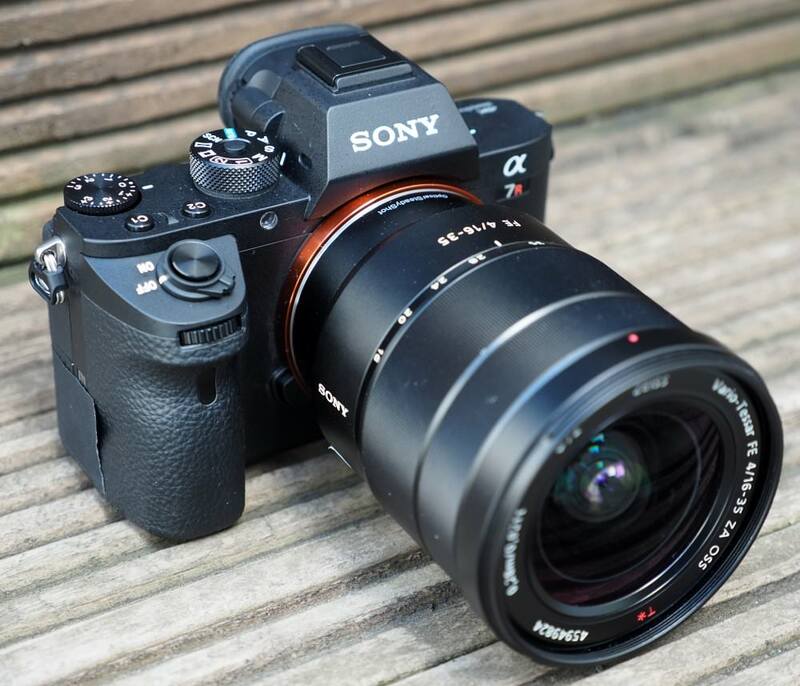 The Sony Alpha A6500 produces images with low levels of noise, and good levels of detail from ISO100 to ISO1600. There's a slight drop in fine detail at ISO3200, but results are still good. Detail drops again at ISO6400, but noise is well controlled, and this should provide good images. ISO12800 is on the edge, as noise increases, and detail is reduced. You may find these images usable if resized, or further processing is applied. ISO25600 and above is best avoided if possible. There is a slight improvement over the A6300, with a little more detail retained as the ISO speed increases. ISO6400 produces usable images, and there is much better noise reduction at ISO12800, compared to the A6300. Overall, colour is good, even when shooting at higher ISO speeds, and the camera produces good photos. Plus, the camera features in-camera 5-axis sensor-based image stabilisation which helps with both photos and video. The X-H1 has an ISO range that goes from ISO100 up to ISO51200. We took these test shots using the default noise reduction options. Detail remains good until the ISO speed gets quite high, however, colour saturation remains good even at the higher ISO speeds. There is impressive noise performance up to and including ISO12800. ISO25600 also produces good results, and it's only the highest ISO speed of ISO51200 that you need to avoid. Noise reduction options can be set from -4 to +4, with the default being 0. We took these shots on the default setting and used +0.3 exposure compensation. To access the highest ISO speed of ISO51200 you have to go through the menus to customise the H setting on the ISO speed dial, otherwise, this defaults to ISO25600. There's a slight but noticeable improvement in noise performance at these higher ISO speeds of ISO12800, and ISO25600 compared to the Fujifilm X-T2. The results are pretty much on a par with the class-leading Nikon D500 / D7500. 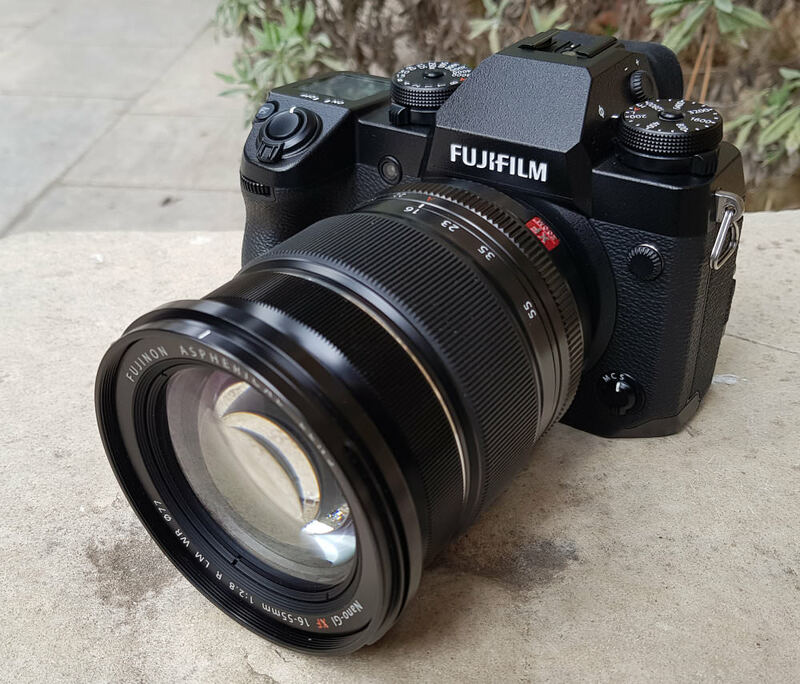 Plus, with the introduction of in-camera image stabilisation, Fujifilm has joined Pentax, Olympus, Panasonic, and Sony by giving customers improved shooting possibilities for stills photography, allowing sharp shots to be captured at slower shutter speeds. Noise performance is very good up to ISO3200 and at ISO6400 noise becomes more noticeable, but still provides usable results. The noise in images is quite "grainy" or "film-like" which gives images with noise a fairly pleasant look. ISO12800 shows quite high levels of noise, but if you wanted to use these images you could simply resize the JPEGs or process the raw files yourself. ISO25600 shows the highest level of noise, and this is best avoided. There's a further high ISO mode, under the Effects setting on the mode dial, called "Night Vision" mode and the ISO setting will go up to Hi.2. 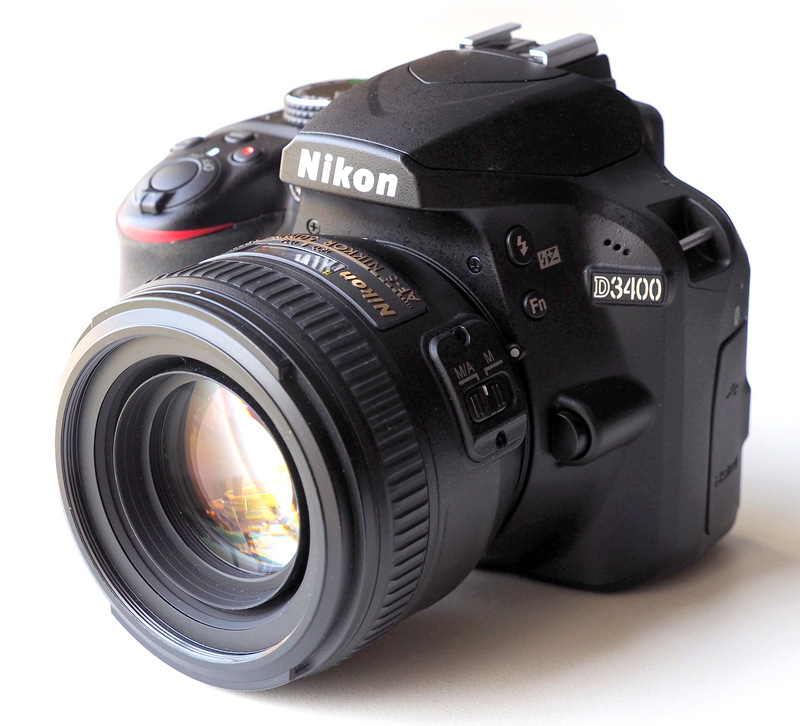 The Nikon D3400 gives better noise performance at ISO6400 than the Canon EOS 1300D and is also slightly better than the K-S2, and A68. There's also a slight improvement over the D3300. For those looking for DSLR image quality then noise performance is very good and better than much of the competition at this price point. 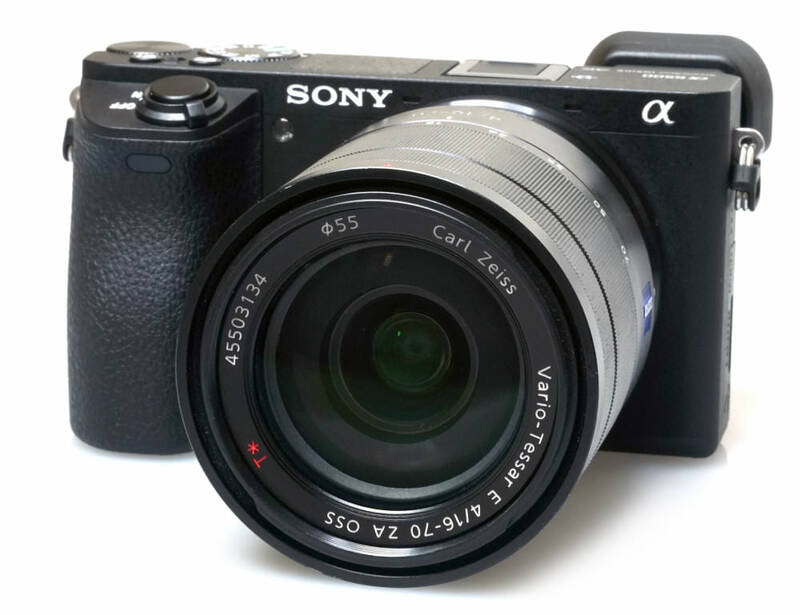 To find more APS-C Cameras, have a look at our 'Top 13 Best APS-C Digital SLRs' list. Micro Four Thirds cameras provide DSLR sized sensors and DSLR image quality in a much more compact camera body which means you're not weighed down with bulk but can capture the same quality photos. The Panasonic Lumix GH5S is designed to be the best low-light video/photography camera available. There are three options for "Dual Native ISO", Auto, Low and High. If you select Auto, and the camera will automatically switch between Low native ISO, and High native ISO when needed. The Low ISO option limits the ISO range to ISO80 up to ISO800, and the High ISO option limits the ISO range to ISO800 up to ISO204800 (with extended ISO switched on). Noise reduction can be set from -5 to +5, and we took these shots on default settings. Comparing the GH5S to the GH5, there are better results at ISO25600, even when resizing the GH5 images down to 10mp, the results from the GH5S are better, with lower noise and better colour saturation. There is roughly 1 to 1.5 stops advantage for stills photography, with it being possible to shoot at ISO12800 and possibly ISO25600 whilst still getting usable results straight from the camera. The results don't quite match the Nikon D500, at ISO51200, with the D500 giving better slightly results, and 20mp images. The same can be said when comparing images to the Sony Alpha A7S Mark II, however, the results at ISO51200 are impressive for a Micro Four Thirds camera, and images are reasonable. You may actually be able to use these images for use on the web or re-sized. This is quite an impressive achievement, considering normally Micro Four Thirds cameras normally don't even have an ISO51200 setting. The difference between the two Dual Native ISO modes (Low and High) allows the camera to give a better low-light performance, and a wider usable ISO range, for both stills photography and video. However, it's likely that the area where users of this camera are going to find the most benefit is when recording video. There is no built-in image stabilisation, which is preferable for some professional video producers, for example when recording with the camera mounted inside or on a vehicle. 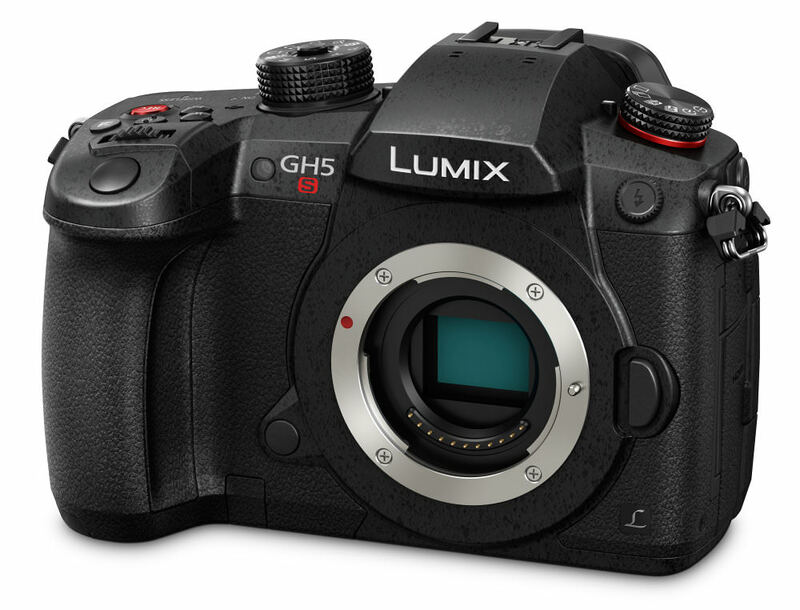 The Panasonic Lumix GH5S offers a wider ISO range than most and delivers impressively clean video up to and including ISO25600, which is impressive, considering the highest ISO speed available was ISO12800 on the GH5. 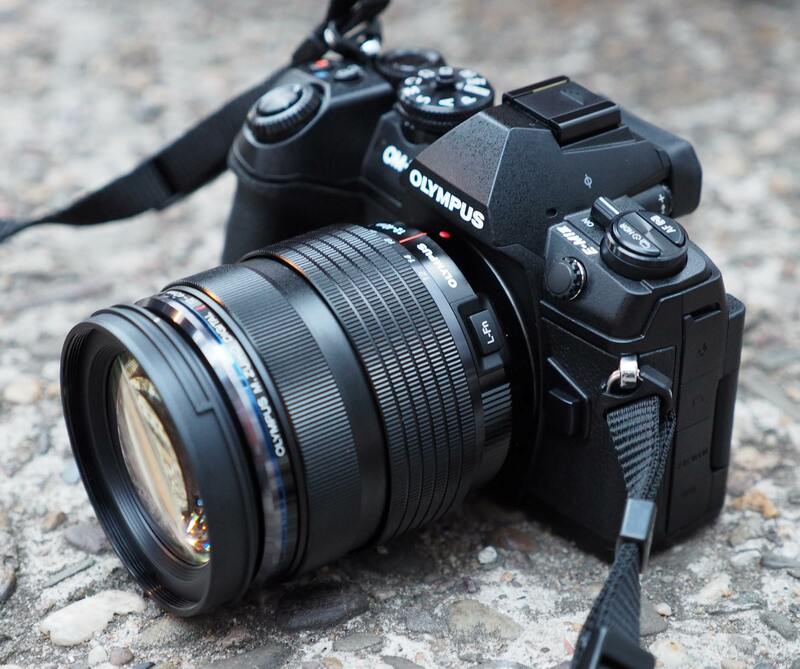 If you want a stills camera, have a range of Micro Four Thirds lenses, and what to take photos in low-light conditions, then the GH5S is also worth looking at if you think you can manage with 10mp images. However, compared to the majority of other cameras, this is quite a low resolution for images. With a 20-megapixel sensor, 5-axis image stabilisation and an impressive ISO range, the Olympus OM-D E-M1 Mark II is well-worth looking at. 5-axis sensor-based image stabilisation is impressive, with it being possible to shoot sharp images at 1/5th of a second handheld or slower, letting you create images that you would normally need a tripod for. It also means you can record professional looking video without the need to invest additional money in a stabilisation system. Plus, both OIS and sensor IS are available with some lenses. 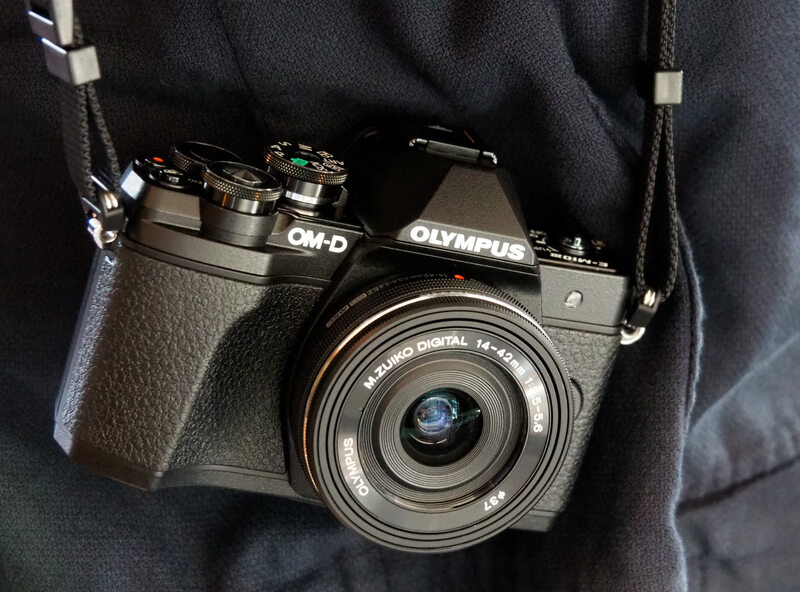 We are seeing slightly improved noise performance from this camera, compared to the 20-megapixel Olympus PEN-F. There's also a slight step up in noise performance over the original E-M1 at higher ISO speeds like ISO3200-ISO6400, so you get more detail from the 20-megapixel sensor, as well as better noise performance. Images are good up to around ISO6400, although using lower ISO settings gives you more detail and less noise. It's likely you'll want to avoid ISO12800, and above, although these may still provide useful if used on the web or as a last resort. Interestingly, the results at ISO12800 show better noise control (or processing), when compared to the 24-megapixel APS-C sensor Sony Alpha A6300. Noise options available include: Noise Filter: Off, Low, Standard, High, and you can see the difference between these when viewing the "High Res" versions of the images above. You can safely set the noise reduction to Low for a little bit more detail in images, while only a slight increase in noise. The standard ISO range available is ISO200 to ISO25600. ISO100 (Low) is also available but records lower dynamic range. For the lowest noise and best detail possible we would recommend using ISO100 to ISO1600, as images have low levels of noise and good levels of detail. For lower light situations ISO1600 to ISO6400 still provides good results, although noise increases and detail is reduced. At ISO12800 noise levels become strong and we would recommend avoiding this setting if possible, although results may still be useful if resized and used on the web. ISO25600 is best avoided as noise is high, and detail is low. The G9 almost matches the Olympus E-M1 Mark II for noise performance up to ISO3200/6400, however, colour saturation on the G9 drops off quickly as the ISO speed is increased in comparison. The E-M1 Mark II also manages to produce better results at ISO12800 and ISO25600, whilst the G9 doesn't manage to produce as usable an image at ISO25600. Noise reduction can be set from -5 to +5, and we took these shots on default settings. The image stabilisation works in combination with the lens' optical image stabilisation in order to give up to 6.5 stops and the 5-axis image stabilisation system helps make even handheld video look good. Noise is very low between ISO100 and ISO1600. At ISO100 (Low) the dynamic range recorded by the camera is reduced. For low light situations ISO3200 to ISO6400 provides good results, although noise reduction is quite strong and detail suffers, particularly at ISO6400. At ISO12800 noise becomes stronger, detail is reduced, and we would recommend avoiding this ISO speed if possible, although results may still be useful if resized, used on the web, or if further image processing is applied. ISO25600 is best avoided, as noise increases, and image quality suffers. Noise reduction options include: Off, Low, Standard, and High. The Default is Standard, and we've taken these shots with this setting. There's a slight improvement in noise performance, or rather noise processing when compared to the OM-D E-M10 Mark II, and you may want to use the Low setting for less aggressive noise reduction, and improved detail. You'll also find 5-axis image stabilisation built-in which helps improve the quality of shots captured. To find more Micro Four Thirds Cameras, have a look at our 'Top 15 Best Premium Compact System Cameras' list. We put compact cameras under this category when they have a larger than normal sensor built-in and a number of these types of cameras now also feature manual controls.The larger sensor means they offer better low light performance than other, less expensive and more basic compacts on the market. The camera gives excellent noise performance, from ISO200 up to and including ISO6400. We would say that ISO12800 provides usable results, without any additional work particularly needed. At ISO25600, images would benefit from further processing such as resizing the image, converting to black and white or applying further noise reduction. This is quite impressive, and it’s only ISO51200 that we would avoid using. ISO100 (Low) gives images with lower dynamic range and has the potential to produce images with blown highlights. Using the ISO speed dial on top of the camera you can select ISO100 (Low) to ISO12800. After this, the only setting is H, which can be set in the camera's menus to be either ISO25600 or ISO51200. You can also customise the front and rear control wheels so that they can set the ISO speed, in case you find the ISO speed dial on top of the camera fiddly. 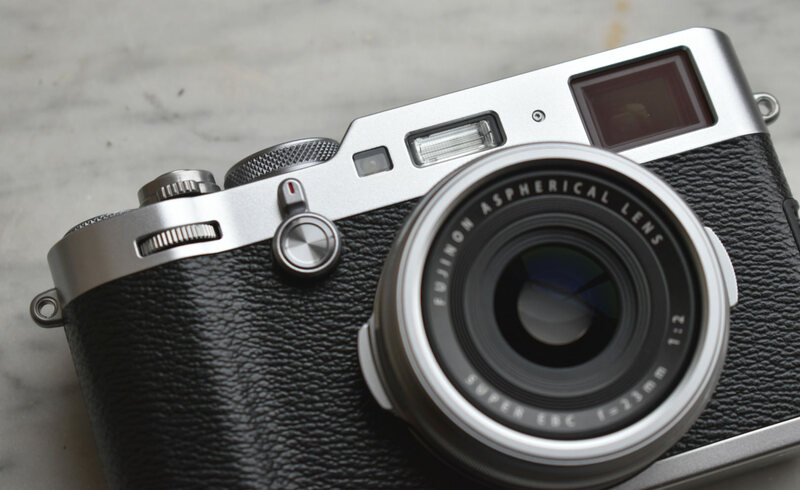 The X100F also has a relatively bright f/2 lens and a decent sensor size making it more suitable for low light photography. Noise performance is excellent from ISO100 to ISO1600 with clean results and good colour reproduction. At ISO3200 and ISO6400 noise starts to become more noticeable, but results are still good with usable images. At ISO12800 there is a further increase in noise, with a slight drop in colour saturation, particularly in the shadows or darker colours, but images may still be useful depending on your needs. Noise at ISO25600 is high, and this setting is best avoided unless you have no other option. There are High ISO speed Noise Reduction options of Low, Standard and High. The default is Standard, and these shots were taken set to Standard. With the same APS-C CMOS sensor as the EOS 80D, image quality and noise performance are almost identical to the EOS 77D and 80D, with excellent results up to ISO6400. Compared to the Sony Cyber-shot RX100 Mark V, which has a 1inch 20mp BSI CMOS sensor, results at ISO6400 are similar, with slightly cleaner results from the G1 X Mark III, and at ISO12800 the Canon has an advantage, with better results. The Canon doesn't quite match the noise results when compared to the Fujifilm X100F, at ISO12800 with the X100F giving cleaner results. The only weakness is the f/2.8 lens, which isn't as bright a lens as some cameras. For the lowest noise and best detail possible we would recommend using ISO80 to ISO800, as images have low levels of noise and good levels of detail. For lower light situations ISO1600 to ISO6400 still provides good results, although noise increases and detail is reduced. At ISO12800 noise levels become strong and we would recommend avoiding this setting if possible, although results may still be useful if resized and used on the web. ISO12800 and ISO25600 could still be useful when shooting using the multi-frame noise reduction mode, however, detail is low. 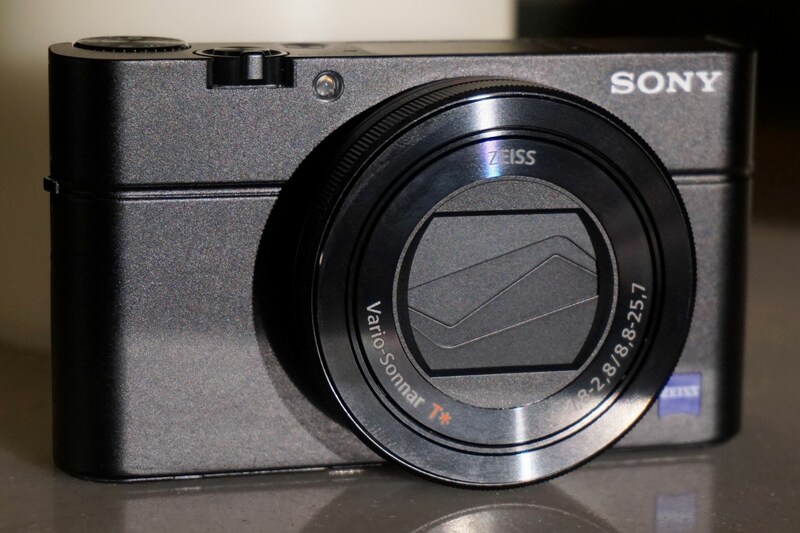 Another plus point for the RX100 Mark III is that it features 5-axis IS, something not all compacts have. To find more Serious Compact Cameras, have a look at our 'Top 10 Best Serious Compact Digital Cameras' list. Light levels can be low when underwater so as well as having a camera that's waterproof, you want one that can perform well in low light. It also helps that these cameras are shockproof and freezeproof which makes them ideal for travelling to a wide variety of locations. The Olympus Tough TG-5 builds on the TG-4 before it, adding a new 12mp sensor that improves noise performance. Noise is at its lowest when shooting at ISO100, with good levels of detail. Detail remains good as the ISO speed is increased to ISO200 and ISO400. There's a slight drop in detail at ISO800, as noise increases. Noise increases again at ISO1600, but colour remains good. ISO3200 may still provide useful results if you resize the image. Colour saturation drops off noticeably at ISO6400 and above, and it's at this setting that you probably want to avoid. Some purple fringing is visible around the white text and squares in the images at the lower ISO speeds. 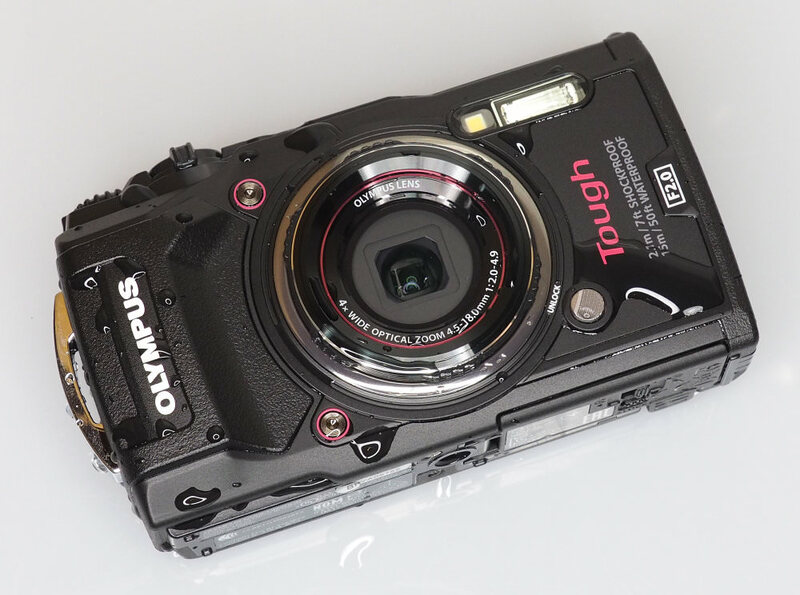 The camera also offers a bright f/2.0 lens, making it more suited to underwater photography compared to other waterproof cameras, as there is less light underwater. 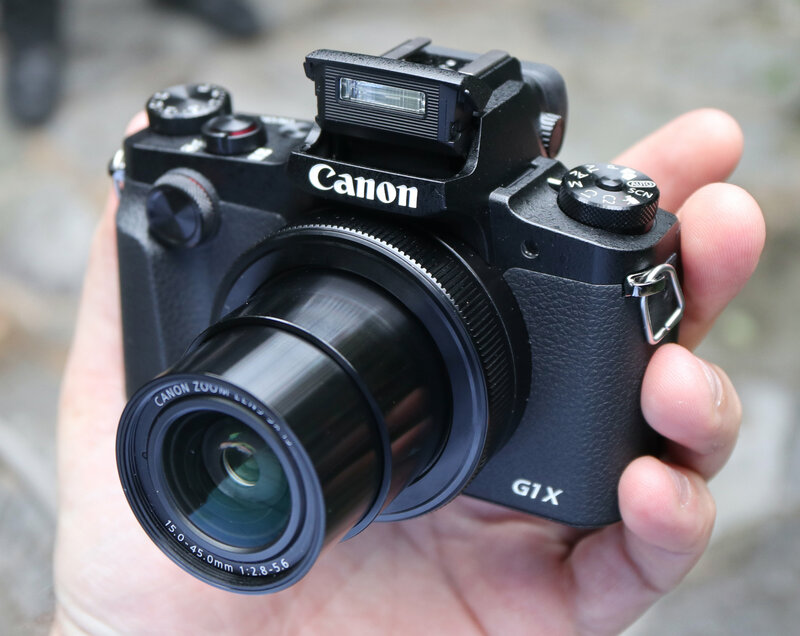 The Canon Powershot G1X Mark III, which is already on our list, can be purchased with underwater housing (WP-DC56) which gives waterproofing down to 40m / 130ft while still giving access to all the controls available on the camera (excluding the touch-screen). The housing, combined with the camera's excellent low light performance, make it an ideal option for underwater photography. You can also purchase waterproof housing for DSLRs but good housing isn't cheap. To find more Waterproof Cameras, have a look at our 'Top 10 Best Waterproof Tough Cameras' list. We also have a section of the site dedicated to 'best buys' and 'top lists' which you can find here: Best Gear, Top 10s and Buyers Guides. No discussion of the best low light cameras is complete without Canon's ME-20f-SH. There is no competitor. No mention of the Pentax K-1. I have found it to be a excellent camera in low light. More dynamic range then the Canon 5D 4 Craps all over it. Should do your home work a bit better.